Cannot Connect GSA Captcha Breaker Windows 10 — . :: GSA SEO & Marketing Forum ::. 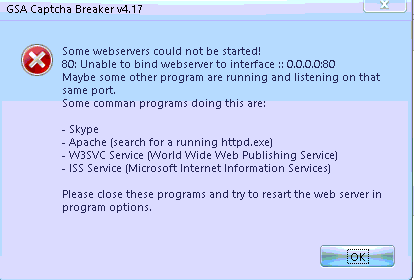 I am trying to launch the GSA Captcha Breaker but it does not work. It shows an error. I have disabled Anti-virus. I have installed and run both GSA Ser and GSA Captcha Breaker as Admin. Still no luck. I appear to have no programs running. What I need is for GSA Captcha Breaker to run and the failed captchas should go to Death By Captcha. Please help with this config. Ahh please disregard my message. I think I got it working. Just had to add the the GSA Breaker in the GSA SER config. Yes, but thats not solving the error really. You can however disable the webserver option in Captcha Breaker as SER will work without that.